In 1988, the Texas Association of Property Tax Professionals (TAPTP) was formed to unite professionals involved in all aspects of property tax management within the state of Texas. TAPTP has established itself as the clear voice of unified property tax professionals and has prevailed in multiple legislative and licensing issues. Join us to promote and support a property tax system in the State of Texas that will preserve, protect, and defend the rights of taxpayers. Improve your practice of property tax consulting through education and promotion of high standards of competence and efficiency. Help support constructive changes in the property tax system in order to make it more efficient and responsive to taxpayer’s needs. Save the Date for the 32nd Annual Conference! 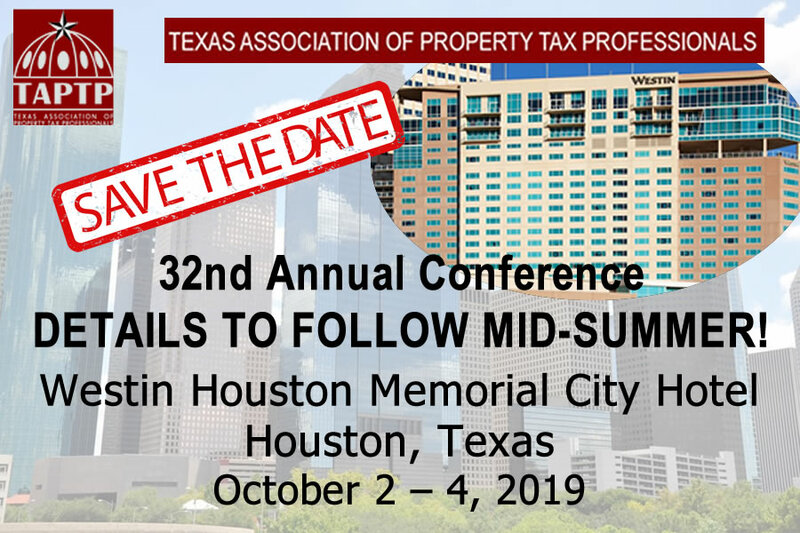 To be held October 2 – 4, 2019 at The Westin Houston, Memorial City.